The author, who worked as a coal miner as a teenager, reviews this classic documentary about a miners’ strike in Kentucky, and talks about the historic significance of these struggles. 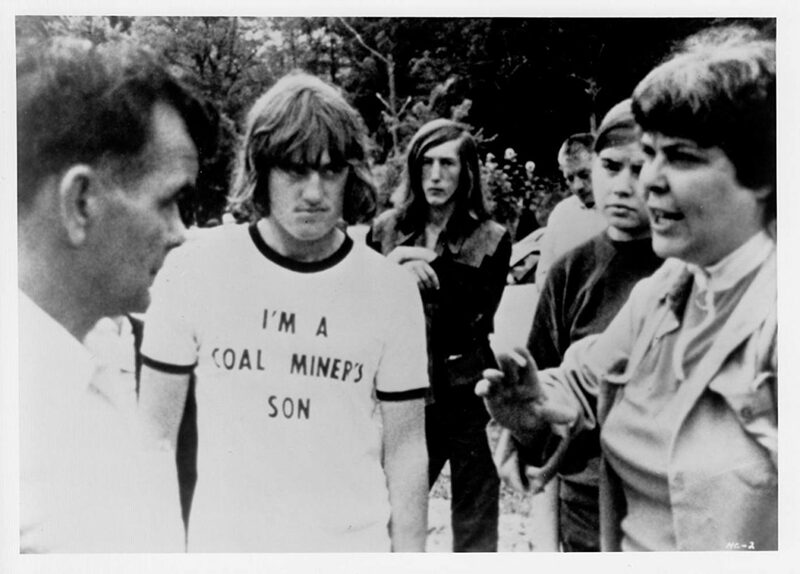 Barbara Koppel’s 1976 documentary Harlan County, USA depicts the efforts of coal miners employed by the Duke Power Company in Brookside, Kentucky (in Harlan County) to win recognition for their union, the United Mine Workers of America (UMWA), after the company’s refusal to accept the miners’ petition for union membership. The film was made over the duration of the resulting strike and follows the lives of the miners and their families, making extensive use of moving interviews as well as direct footage of the picket lines, union meetings, and court hearings. The miners in southeast Kentucky stayed out on strike from June 1973 through August of 1974, a thirteen-month slugging match that only ended when a twenty-two-year-old striker, Lawrence Jones, was murdered by a mine foreman, leaving behind a sixteen-year-old widow. I am from western Maryland, and I associated with rural West Virginia (or should I say West-by-God?) far more than I ever did with urban Washington D.C. or Baltimore or their suburbs. When I was a teenager, I worked as an underground coal miner in northern West Virginia and was an active member of the UMWA. People from that part of this country have a very distinct pride and culture. Hell, I only found out that John Denver’s Country Roads wasn’t actually titled “Almost Heaven” until I moved away. Part of that culture is the legacy of coal mining. Movies depicting class struggle in the coal industry, such as Matewan and The Molly Maguires, are esteemed as sacred. For this reason, I was shocked to only recently learn of Harlan County, USA. After having watched it, I understand why. The movie is brutal and graphic in a way that those other movies simply aren’t. Matewan and The Molly Maguires are fiction based on reality; Harlan County, USA is simply reality, in all its hideousness and horror. For those of us who have lived in that world, it is downright painful to watch. Truthfully, the first time I watched the movie I had to stop partially through. It was too much. I imagine the same is true for others throughout Appalachian coal country. As a documentary, it is likely the most raw depiction of a strike that will ever be seen on screen. Interestingly, Koppel’s original intention was not to make a documentary of a strike. Her original plan was to make a movie about the UMWA’s internal politics of the late 1960’s and early 1970’s. In the 1969 mineworkers election, Joseph Yablonski challenged then UMWA president Tony Boyle for the position of president. Boyle was viewed as being in the pockets of the mine owners, and was exceedingly controlling in this role. Yablonski, on the other hand, was widely popular among the rank and file. Yablonski was defeated in an incredibly corrupt election. Yablonski then asked the U.S. Department of Labor to investigate the election for fraud. Soon after that request, Yablonski, his wife, and his daughter were murdered in their sleep at their family home. While certainly a powerful action, the murder of the Yablonski family was also an equally stupid one. The day after the news broke, 20,000 mineworkers in West Virginia went on a one-day strike to protest the union leadership. As mineworker lore goes, the Miners for Democracy caucus was started in the basement of the church immediately after Yablonski’s memorial service. Soon, Tony Boyle saw his position stripped when the Department of Labor overturned the 1969 election and he subsequently lost to the Miners for Democracy candidate, Arnold Miller, in 1972. Less than two years later, Boyle was convicted of the Yablonskis’ murder and lived out the rest of his days in prison. The story is certainly interesting, and probably not a bad movie idea in and of itself, but felt out of place in the film. Frankly, the entirety of the strike happens not under the Boyle administration, but under the reform Miller administration. Moreover, the strike had virtually nothing to do with the UMWA’s internal politics. The Harlan county miners were out on a recognition strike. Koppel’s choice to go back and forth between the fight for UMWA leadership and the fight between the miners and their bosses was more confusing that anything. However I do think that this aspect of the movie casts a serious look at just how corrupt unions in America have been (and perhaps still are). While perhaps out of place in this movie, the leadership struggle does highlight one important lesson: changes in leadership almost always mean more of the same. When the miners pushed against the coal operators’ insistence on a no-strike clause, the union leadership — under reformer Miller — ignored the miners’ desires in contradiction of their campaign emphasis on allowing the miners to address working conditions on the local level. It was only implied in the movie, but Miller fought for the no-strike clause under pressure from the government and the coal operators (including a visit from the U.S. Secretary of the Treasury). A particularly telling scene shows a group of miners expressing their disbelief that the man they elected to reverse the cozy and conciliatory approach of the Boyle administration towards the coal operators and the federal government was now changing his tune during negotiations of the national contract. While they are discussing this amongst themselves, an older miner interrupts with the astute statement “[Miller’s] an honest man but he’s no match for them bunch of clowns.” It is understandable when leaders “sell out” — there is an extreme amount of pressure with real consequences to do so. Any action brought against the union for work stoppages would almost certainly target the UMWA leadership heavily. The leaders aren’t bad people for becoming conservative. If you or I were in that position I doubt that we would do any better. The important takeaway is that the officer-heavy model of U.S. unions is very much prone to this problem and that we ought to look at other models to organize our unions. More striking is Koppel’s footage of the strike and its participants in Brookside because of how unique this raw of a documentary truly is. The movie has a feeling of aimlessness and lacks a coherent story, but hidden in the chaos are kernels of pure gold: the participants of the Brookside strike. The movie ends on a seeming high note: the miners return back to work having won their union recognition and their union contract. The ending, however, has an unspoken truth: the miners’ victory was almost a fluke. The movie seems to suggest that the only reason that Duke Power negotiated with the union was the death of a young miner. The UMWA staff organizers parachuted into Brookside admitted that they were never able to cripple the coal company’s production enough to bring them to the negotiating table. Indeed, the movie gruesomely depicts the miners’ failure to stop scabs from working the mine. Similarly the movie shows other largely symbolic antics attempting to pressure the company, such as a delegation of miners flyering outside the New York Stock Exchange hoping to persuade traders not to buy stock in Duke power. Experience tells me only one thing wins strikes reliably (or demands/grievances more generally): the ability to control the production process. You must be able to keep that coal in the ground. The UMWA’s past experience demonstrates this. By comparison to Harlan, the Pittston strike in 1989-1990 shut down almost 70% of that company’s production (and completely halted production during the Moss 3 refining plant occupation) — and won back the health care benefits of around 1500 miners and their families, as well as the Coal Act of 1992 that requires all coal operators in the U.S. to provide health care and retirement benefits for their employees and the widows of their employees. Control of the production process from the shop floor is certainly the most powerful factor, but the movie also depicted a powerful aspect of the Brookside strike and something that organizers should take note of: the organization of miners’ wives. I am generally leery of “community” organizing as it seems vague, but in this situation it was very effective. The union effort was taken up just as strongly by those immediately connected to the miners as it was by the miners themselves. In fact, the miners’ wives’ organization was far more vibrant than the union itself throughout the movie. They took the fight to the company in extremely creative ways. In fact, they were the only group to successfully stop the scabs from getting to the mine for the duration of the movie, when they organized an ambush picket in an adjacent town. Perhaps less a reflection on Harlan County, USA than upon the “Left” itself, I was struck by how infinitely more radical the miners and their wives were in the movie than almost every leftist I have worked with, as well as the total disconnect that there is between the two (workers and the left). The Harlan residents were effectively Marx dressed in conservative clothes. I can imagine people scoffing at the language used during the women’s meetings about their and their husbands’ lack of human dignity. To them it was unacceptable because they were “American citizens” and such treatment was a denial of their “constitutional rights.” However they are the ones taking the fight to the bosses, fighting for the dignity of working people while the scoffers do nothing but judge others. Additionally, their understanding of the world was outstanding. Littered throughout the movie were reflections of their class consciousness and their very deep understanding of their position in the class struggle. The left ought to take note and seriously think about how it presents itself, because the participants of this strike are expressing powerful ideas about the world in a way that isn’t way in the clouds and doesn’t sound like some wingnut conspiracy. More importantly though, they were doing something about it. Of everything in the movie, I must say what stands out in my mind most prominently is how powerful the legacy of class struggle in the coal industry is to the participants. When I worked in West Virginia I noticed the exact same thing: there is a continuity to these struggles. The references to their fathers’ or their grandfathers’ actions in the past are constant. Almost every participant in the movie mentions either their personal experience fighting the bosses, or someone related to them’s experience fighting the bosses. I would even say that this memory of the struggles of the past are the backbone of the miners’ fight in the movie. I remember in West Virginia everyone seemed to be related to someone involved in the Pittston strike. My coworkers would bring up how the miners had to fight in Matewan, had to siege Blair Mountain. And we most certainly all remembered Upper Big Branch. More and more it has been my observation that struggle begets more struggle. Organization is a muscle than needs to be exercised. Sometimes you get your demands, more often you fail, but if you strengthen your organization and capacity to push, then you win something much greater. The most important thing is that we, as organizers, continually do the work of organizing with our fellow workers. The more we organize, the more we engender a tradition of class struggle among our fellow workers and their posterity. To anyone sincerely interested in a better world, where those who do the work and keep this whole thing running are the same ones who enjoy its bounty, watch this movie. But please, do keep a box of tissues on hand.